Italian scientists claim they have found the remnants of a meteorite that they say created a Siberian lake more than 100 years ago and Russian scientists want them to prove it. “Italian Hoax” and “Unbelievable Adventures of Italians in Siberia” are two of the most popular headlines for articles about an Italian research team that appears to have discovered the mysterious meteorite at the center of the Tunguska Event, a mysterious atmospheric explosion over Siberia more than a century ago. Yet skepticism in Russia abounds. What can these sun-loving Italians know about our severe Siberian taiga, wondered scientists and columnists. But it was no hoax, and no fantasy. 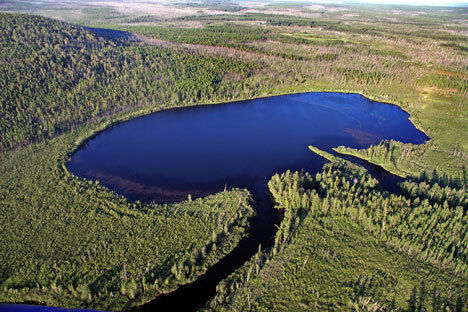 Since 1991, a team of scientists from the ISAR Institute for Marine Geology in Bologna have been coming to the Podkamennaya Tunguska River basin, where the blast shook the Earth. Some of the researchers, especially Luca Gasperini, the leader of the expedition, know the local taiga better than many of the locals. Soviet scientists Vladimir Koshelev and Kirill Florensky were the first to hypothesize about the location of the crater; the two pinpointed Lake Cheko as the possible impact crater back in 1960. Yet there was no technical means to verify their hypothesis at the time. And with the possible crater full of water, scientists were not able to ascertain whether it had the telling bowl-shape made by the impact of an object hurtling through space. The news of a meteorite falling in the Siberian taiga became an international sensation – a few days before the event, in June 1908, another celestial phenomenon had caused a stir, when so-called silver clouds appeared in the sky in the Northern hemisphere for a few nights in a row. Those luminous clouds caused panic in Europe, Russia and Japan. The Tunguska blast became a logical explanation – the silver clouds were called clusters of interstellar dust that got into the upper stratosphere from the tail of a comet, whereas the fireball was a chip from the comet’s core, some reasoned. There were alternative theories later. In the 1920s, the young Leningrad geologist Leonid Kulik put forward a new hypothesis. He came up with something quite intriguing: the core of the “lost comet” consisted not of ordinary iron, as many scientists believed in those days, but of an extremely rare alien mineral with colossal explosive power. The discovery of this matter would provide man with an unlimited source of energy. Yet none of the many expeditions to Siberia discovered the meteorite or even the impact crater. Moreover, the site that scientists believed was ground zero for the explosion had no crater, just “dead forest” – charred trees standing undisturbed, albeit stripped of twigs and bark by the fire. Soviet scientists in the 1960s focused on Lake Cheko, a body of water some 5 miles from the assumed ground zero with an unusually round shape. What if the lake were the original crater, which was later filled with water from the Kimchu River? Gasperini said he has no doubt that this version is what really happened. “Some time ago, my colleagues from Bologna University and I drilled a few holes to take ground samples from the lake shore,” the scientist said. “It appeared that, under the sludge, there was a layer of totally different sedimentary formation that we called “Siberian slush” or “hairball” – the ground was mixed with debris and wood chips. Our experts discovered pollen that was hardly older than 100 years in that slush.” These “hairballs” offered the first evidence that the lake had only recently been a forest. Three years ago, the Italian scientists conducted another test: they used sonar and an echo depth sounder to make a three-dimensional map of Lake Cheko. To check their theory, the Italians had to look through Russian archives. Finally, the Italians’ best card: Professor Michel Pipan at the University of Trieste hired an Mi-26 helicopter in Krasnoyarsk to carry out geomagnetic aerial photography of the lake and its surroundings. “Soon” stands for “when we find enough money to finance the drilling phase.” It was for the purpose of raising money that an article in “Geochemistry, Geophysics, Geosystems” journal was published, announcing the demystification of the Tunguska event. The sensational conclusions reached by the Italians have received a mixed response from the Russian academic community, however. Dmitry Kachalin, head of the “Rocks from the Sky” search group and full member of the Russian Meteoritics Society, shares some skepticism.